Won’t be seeing it this December. Will have to wait another year. The picture represents a wide path. 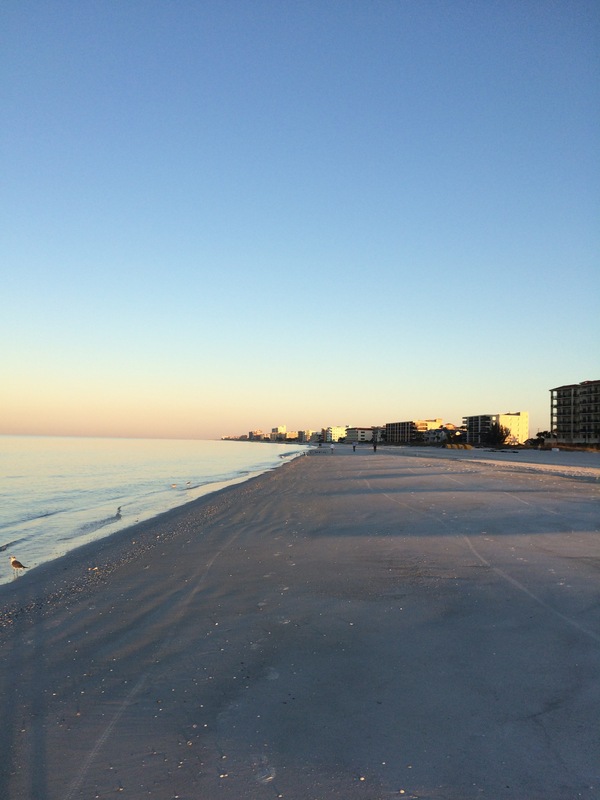 Morning, afternoon and evening runnings along the Gulf Coast. I’ll turn around somewhere before St. Pete’s in one direction, Clearwater in the other. You can be surrounded by cold beers and simple cheers. Walk anywhere to get almost anything. Take a bus the distance between two metropolises. Spend a short time walking to get food and drink. Whether you bring it home, sit in the sun or shade. Close by there’s Coffee roasted and ready nearby where the ladies behind the counter openly flirt for tips, earning a nice few dollars in the process. You can sit along the window overlooking the boulevard and laugh at people wearing parkas when the temp reads 15 degrees Celsius. This year, I’ll miss watching the Dolphins make their morning trip in one direction. Then I’ll miss seeing them all return from their day of steady fishing and acrobatics. I’ll miss the bird life that flies up the coast, or stands in the sands. I’ve had a few pictures with a Heron, Egret and Pelicans. Forget trying to have a conversation with them after hoisting a few. They simply would respond with a stone-faced silence. They seem to know I respect their views. After all, I’m on their turf. Just visiting. I’ll miss the moon shining out in the Gulf of Mexico, tempting another run along the crashing waves as the dark swallows up the day. Until next time. Posted in Notes from the Frogpond.Tagged Clearwater, Dolphins, Florida, Gulf of Mexico, Heron, Just visiting, Mad Beach, Madeira Beach Florida, Maderia Beach, parkas, Pelicans, St. Pete's, sundayblogshare, sunshine, writing.